If all you’re looking for is a cup of coffee, espresso, or ristretto, it’s a decent, but uninspiring machine. If you want anything more than that, this isn’t the model you’re looking for. Recommended for: Casual coffee drinkers who aren’t looking for more than just the basics. Do you love a great cup of coffee in the morning, and once you have it, you’re done for the day? 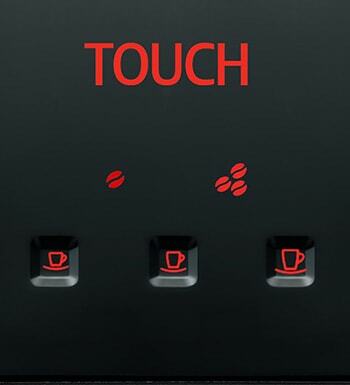 Are you looking for a simple coffee machine that offers one-touch convenience, but doesn’t bog you down with tons of bells and whistles you don’t have any intention of using anyway? If you answered yes to either of those questions, then you’re probably going to like what you read in our detailed Jura Ena Micro 1 coffee machine review. The problem is that it only describes a tiny slice of the market, and even if it describes you, sooner or later, you’re probably going to want to experiment. Unfortunately, experimentation with this machine is extremely limited. That’s not to say it’s a bad machine – it isn’t! It’s pretty good at the three things it does; it’s just that most people want more than that, especially from a machine they’re going to be spending about a thousand bucks for. So if you’re considering this one and haven’t quite made up your mind, keep reading, and we’ll go over everything this model can do, and outline the numerous things it just wasn’t designed for, so you’ve got a complete picture before spending your hard earned money. The first thing you’ll notice about the Jura Ena Micro 1 espresso machine is its compact size. Measuring just 9.1” x 17.5” x 12.7” and weighing in at a scant 19.4 pounds, this is not a machine you’re going to have any particular difficulty finding a permanent home for. It’s dressed all in sturdy, black ABS plastic with a few metal highlights, giving it a sleek and modern, if somewhat understated appearance. All that to say that it’s aesthetic is likely to blend in fairly well with your kitchen décor. At the very least, it won’t clash horribly. This is always a big deal for us. As power coffee drinkers, we like machines with expansive water reservoirs, so right off the bat, we knew this machine wasn’t designed with us in mind. 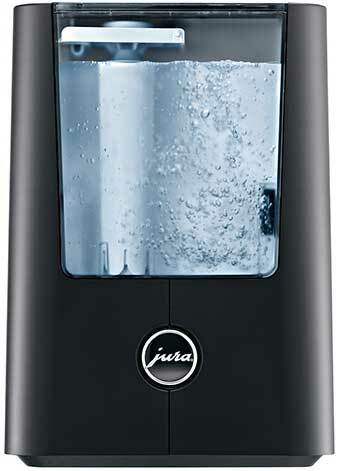 The Jura Ena Micro 1 automatic coffee center features a tiny, 37-ounce tank, and comes with an optional water filter. Note that if you opt to use the included filter, your already small capacity will drop to around 32 ounces. This is fine for people who live alone and don’t drink a lot of coffee, but this machine would be completely overwhelmed by a large household with multiple coffee aficionados. It just would be able to keep pace, and you’d find yourself having to constantly refill the reservoir. Not good. Since the water filter is optional, we’d recommend simply not using it. True, if you use it, you’ll cut down on your maintenance because you won’t have to descale the machine as often, but in this case, it makes the limited water supply notably worse. Besides, there are other ways to minimize your descaling. Simply use distilled water, or, if you already filter your water at the kitchen sink, then the built-in filter would be a redundancy anyway. While the size of the water tank is somewhat subjective, the Jura Micro 1’s grinder is a genuine weakness in the design. 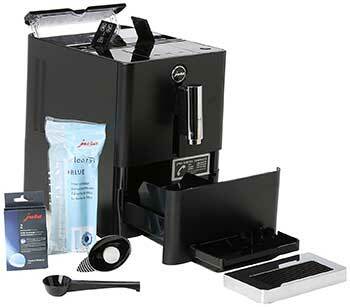 The model features a stainless steel conical burr grinder with five settings; it’s got a couple of problems. First and foremost, stainless steel burrs are inferior to ceramic ones, because they’re more prone to excessive heat, which can sometimes burn your grounds and ruin the flavor of your coffee. Second, the industry average is six grind settings, so this unit falls short again. That’s not necessarily a deal breaker, given the limited number of drinks you can make, but more grind settings allow you to fine-tune the flavor of your drink, and you just don’t have many options here. The grinder is married to a 4-ounce bean hopper, which is too small for our liking but makes a good companion to the water tank, which is a plus. One potential drawback you see on some machines is that when there’s a size mismatch between the bean hopper and the reservoir, it creates a lot more busy work for you, the user because you’re constantly having to stop what you’re doing to refill one or the other. Even though both are smaller than we’d like, at least the Micro 1 avoided that issue, so we’ll call it a win! Also, note that the Micro 1 includes a one-scoop bypass doser for those times when you don’t want the whole “beans to brew” experience. Pro Tip: This is not something that is particular to the Micro 1, but is true of super automatics in general: They don’t do well with oily beans, so for best results, you’ll want to find a nice Medium Roast bean you enjoy, and stick with that! 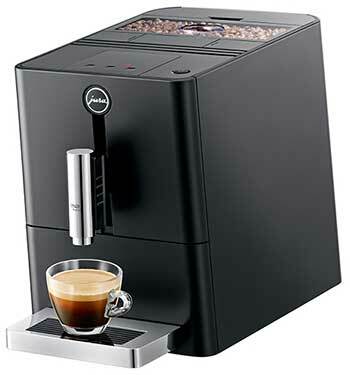 The Jura Ena Micro 1 coffee machine uses a single, aluminum boiler, lined with stainless steel. Normally, we’d say a few words about how we prefer double boiler systems because they give you the freedom and flexibility to simultaneously steam milk and brew coffee, but sadly, the Micro 1 has no milk frothing system, so even if the machine included a second boiler, it wouldn’t have anything to do. The one boiler the Micro 1 has is quite good, featuring Thermoblock technology which allows it to heat rapidly, minimizing the time you have to wait for your drink once you make your selection, but there is an important limitation to be mindful of: There’s no way to adjust the boiler temp. Sadly, all you get is the default setting. If your drink isn’t hot enough for you, then you’re left with the decidedly unattractive option of having to put it in the microwave to bring the temperature up further. While it’s true that this machine doesn’t cost an arm and a leg, it’ll still set you back the better part of a thousand bucks, and for that price, we were expecting more in this department. 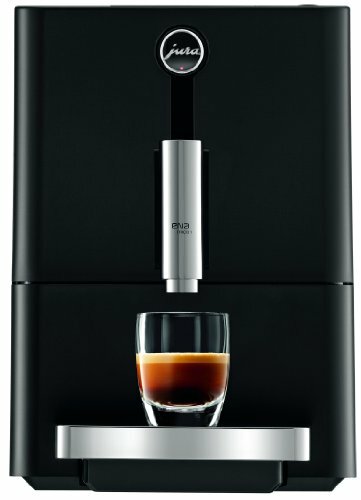 The Jura Ena Micro 1 Automatic coffee machine does come with a telescoping coffee spout, and in fact, when you place your order, you can choose for a single or double spout (same model, the spout configuration is literally the only difference). The spout will move up to accommodate a cup up to 5.5” tall, which is quite acceptable to most casual coffee drinkers, although if you have a favorite jumbo-sized mug, it probably won’t fit in the space provided. On Jura machines, the brew unit cannot be removed. As such, when you want to clean it, you’ll have to make use of cleansing tablets. Simply pop one of these into the bypass doser about once a week and let the machine run through a brew cycle and you’re all set. Regarding the control system, the Ena Micro 1 wins high marks here, because the unit is incredibly easy to operate. Note: This isn’t because the control system is highly optimized, but rather because the unit has a limited feature set. There just aren’t a lot of buttons to worry about, so there’s very little to learn. For each of these, you can control the coffee strength (normal or strong), and the amount of water used per shot. One thing to note about this is that even on “strong,” the Micro one will only hit you with ten grams of coffee, where a lot of other machines will give you sixteen grams on the highest dose setting. If the resulting drink isn’t strong enough for you, adjust to a finer grind and see if that helps, then start decreasing the amount of water per shot. Ten grams is fine for regular coffee, but in our view, even on its strongest setting, the dose isn’t big enough to make a great espresso or ristretto, though if you’re looking for a machine that makes milder versions of these, the Micro 1 is a good choice. The machine also has an auto-shutoff that defaults to two hours, and cannot be changed, so as you can see, your options are somewhat limited on this machine. All that to say, by the time you’ve gotten your new machine set up and thumbed through the manual, you’ll have essentially mastered the machine, and you’ll make your first cup of coffee with confidence. If the Micro one did have more features, it would quickly run up against the limits of its rather primitive interface, but again, you simply won’t have that problem. Before we can talk about the brew pump, we’ve got to say a few words about the difference between espresso and drip brew coffee. You probably enjoyed a hot cup of Joe from a drip brew machine this morning. 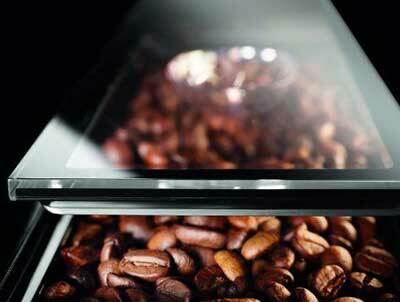 They’re ubiquitous devices, found in almost every home in America, and they use simple gravity to get the coffee from the brewing chamber and into the pot below, where it finds its way into your cup, and then into your belly. Espresso makers don’t work that way. They use pressure, and pressure is measured in bars, with one bar being equal to atmospheric pressure at sea level. The pump on the Micro 1 is rated for a maximum pressure of fifteen bars, which means it’s got plenty of power to make a great espresso, every time you use the machine. 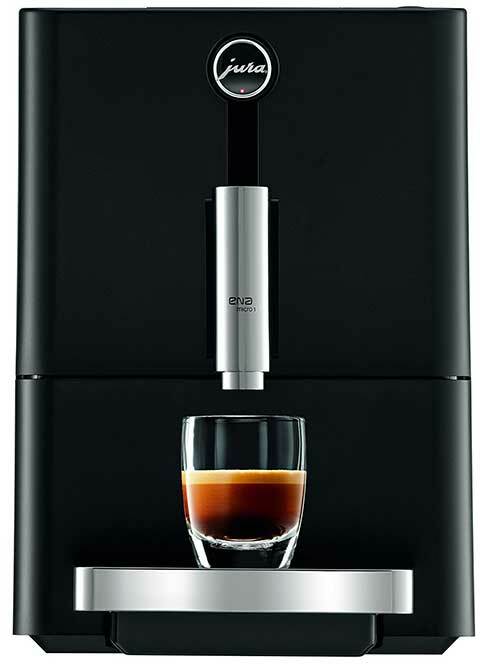 This will be a depressingly short section, because sadly, the Jura Ena Micro 1 One Touch doesn’t come with any means of milk frothing. No steam wand, and no auto-frother. If you like milk-based drinks, and for whatever reason, have your heart set on this model, then you’re going to have to buy a standalone frother. This will be another short section in our Jura Ena Micro 1 coffee machine review, because the Micro 1 Jura doesn’t come with a cup warming tray, sorry. If you’re not happy with the temperature of your drink, about the only thing you can do is fill your cup with water and pop it in the microwave for a couple minutes to heat it, then dump the water and brew. Although the control system is rudimentary, it doesn’t really increase the slope of the learning curve of the Jura Ena Micro 1 bean to cup espresso machine, because of its highly-limited feature set. In fact, we’d go so far as to say that the Micro 1 has no learning curve to speak of, being no more complicated to use than whatever coffee machine you’re using right now. That’s it. That’s all there is to it, and because this is a super automatic, all you have to do to clean the brew group is put the tablet in and push the button. The machine rinses itself. It doesn’t get much easier than that! This is a tough section to write on machines priced at the low end of the market, because almost anything we’d want to add to the unit would increase the price, and thus take it out of the low-end range. That said, this machine would be vastly more useful and versatile if it came with even a rudimentary milk frothing system and at least one more grind setting to put it at the industry average. Neither of those additions would greatly impact the price and would make the Micro one appeal to a much broader segment of the market. If we could add a third item to the wish list, it would be some means of controlling the boiler temperature. If that’s all you’re looking for, this model is a good fit, but most people come to the world of specialty coffee searching for more than just that. 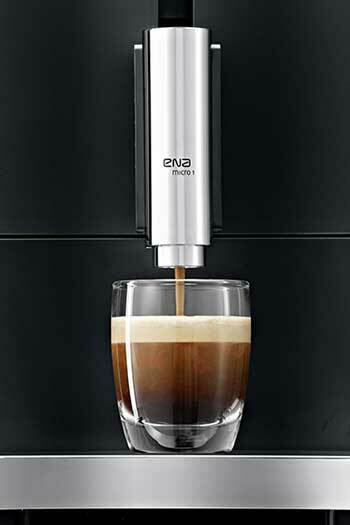 And that wraps up our Jura Ena Micro 1 coffee machine review. As you can see, it’s not a bad machine, but its feature set is quite limited and falls well short of greatness. For the right user, it would be a decent, but unexceptional and uninspiring machine, and the odds are that you’ll find yourself outgrowing it much more quickly than you’d like and chaffing under its various limitations. Having said that, we do provisionally recommend it for single people with tiny kitchens who just want a decent cup of coffee, served up with one-touch convenience. Jura ENA Micro 1 User Manual. ​​Ristretto Coffee - How It's Made​​​. How to Descale Your Coffee Machine? The Coffee Mate. Why Brew Temperature Control Is So Important. By 6 Coffee Roasters.